A 15-year commitment to the maintenance and completion of Mauerpark as a green, cultural symbol and as living proof of coexistence and mutual growth across the former German and European Cold War border. 1) The preservation and development of diversity of plants, people, and uses on the formerly desolate death strip through voluntary maintenance of the green space and care for donated trees. Over the years, the organization has developed working relationships with the relevant authorities, relationships that are shaped by the guiding principals of the organization: delicate interaction not only with the park’s vegetation, but also with other people when problems and conflicts arise. Friends of Mauerpark sees itself as the mediators between the park’s various stakeholders and the preservers of the park’s memory. 2) The active political commitment to the completion of the park. Mauerpark, which was conceived by Professor Gustav Lange and dedicated in 1994 at the former border zone of the DDR, is in its current form only half-complete. In 1999, the Berlin Senate decided not to acquire the necessary territory for the completion of the park. 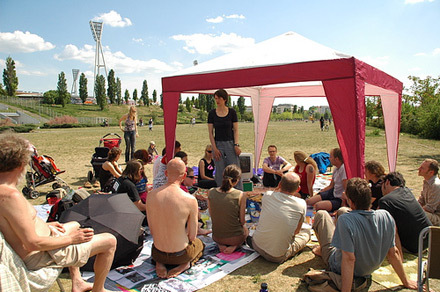 Since 2004, our organization has campaigned against constructing buildings on potential park area: through participating in mediation processes, engaging in public relations, providing information to park users, leading large campaigns, creating a path over Gleim Tunnel and Gleimstraße, and planting donated trees in conjunction with BUND Berlin, as well as championing other initiatives and undertakings in and around the park. For example, we have supported the flea market at Mauerpark, the Mauergarten, and the beer garden Mauersegler as welcome additions to the atmosphere of Mauerpark and have pushed for their integration into the final Mauerpark plan. Fifteen years ago, we began our patient, continuous commitment to major player in the political processes that shape the park’s future. By doing so, we counteract the ever-changing political landscape with our constant, consistent leadership. This is our innovative approach: we have made grassroots political governance is possible through our deep understanding of the place and its stakeholders. The unique feature of our concept is that instead of seeing the completion of the park as a static demand, we understand that the park’s plans must take into account the shifts in local conditions and the rich, youthful life of the area. To that end, we work closely with all of the concerned political, planning, and sociocultural institutions and groups and exchange ideas and coordinate with the park’s planner, Professor Lange. 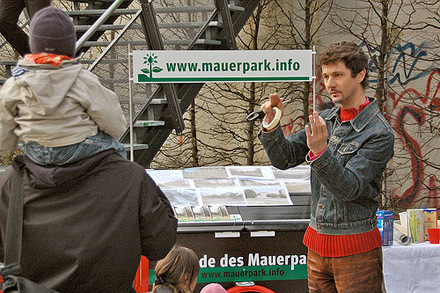 The goal is a completed Mauerpark with an even greater diversity of uses, which also leaves room for commercial possibilities such as the flea market, a marketplace, an indoor playground, a bike tourist station, as well as yet-to-be-integrated spaces such as children’s circuses, spaces for experiencing nature, and much more. The preservation of the diverse population of vegetation and the historical traces of the site is crucial to us, and so we are committed to ensuring their inclusion in further planning so that the completion of the park can unfold to bring about the greatest sustainable impact with limited means. A finished park with minimal expenditure and maximal diversity of use would be a model for other parks and other cities. There is another reason for the necessity of the finished park, which has been possible under zoning laws since 2006: the ever-denser construction of buildings in the surrounding area to keep up with a growing population. With predictions of rising temperatures in the summer months, the preservation of mature vegetation and spaces for fresh air and recreation will become more and more vital. From 1999 to 2004, the organization was active under the name “Freundenkreis Mauerpark.” During this time, through the particular commitment of Bodo Schliefke, the group established a very good relationship with the authorities of the district of Pankow, from the implementation officers of the urban renewal group S.T.E.R.N. to the city councilor for the environment (and later Pankow mayor) Matthias Köhne. Mr. Schliefke received the Pankow Prize for volunteer commitment during this time. Thanks to the Neighborhood Fund’s support of the organization beginning in 2005, we were able to substantially improve our promotional work, in the form of a professional Website and leaflets. Resources from the Neighborhood Fund also made possible the purchase of a carrier cycle, which has been used for park maintenance and as a mobile information stand at events. Above all, it is through the talents and input of our members that we are able to be a major player in the public and in the political landscape of the district. Especially in recent years, a large number of press reports, interviews, documentaries, and university projects have reported on the activities and perspectives of our organizations and relied on our knowledge and resources.